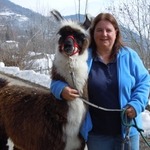 Passionate about alpacas and llamas. Currently breeding both in Italy. My niece worked at the zoo (Andrea Bryant) and I was able to visit on a giraffe 'foot day' and saw first hand the wonderful work being done. As a result I am very happy to contribute to such a worthy cause.